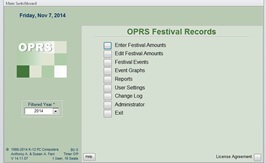 OPRS Festival Record is for recording and tracking money collected from each attraction at any fund raising event. Included are reports to compare amount raised by each attraction per year helping planners to decide which attractions to keep and which to replace. This can include anything from popcorn stand, food concessions, rides, raffles and more. For many parishes the festival is their largest fund raiser of the year. This software can help both during the festival and provide essential information to help the planning committee for the upcoming festival. Festival planning committee members can then review the popularity of the many booths and attractions at their festival to help improve the next event.